Samsung Galaxy Note 9 is the ultimate business mobile phone, complete with an intelligent S Pen, exceptional battery life and large screen for extra productivity. 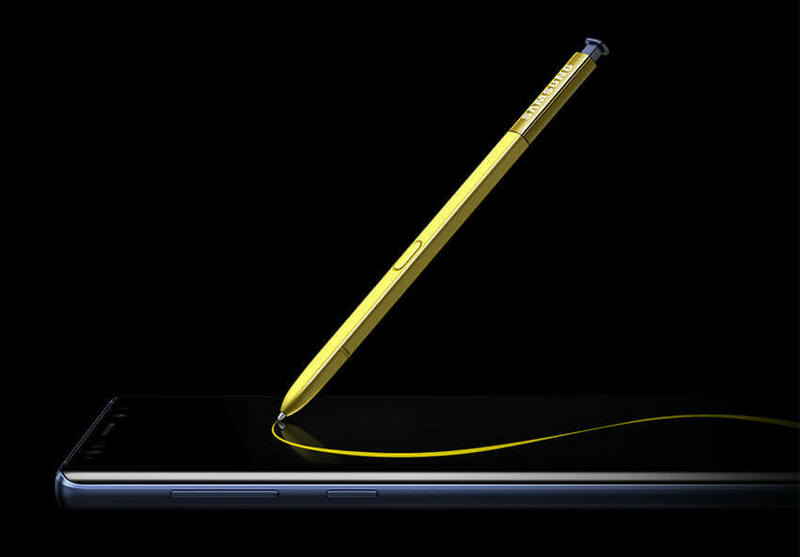 The S Pen that comes with your Galaxy Note 9 is an intelligent tool that can help keep you productive. Connect to Samsung DeX and open a presentation, then switch slides using your S Pen. You can also use it just like a pen, taking notes during meetings by writing on your Note 9 screen. Your Samsung Galaxy Note 9 boasts one of the largest displays available on a mobile. At 6.4-inches, complete with a Quad HD resolution, you can see more on this device, and in better detail. It’s perfect for presentations, taking notes and watching video content. A dual 12-megapixel camera with OIS ensures quality photography results. You can take pictures on the fly and upload straight to your work social media accounts or personal LinkedIn, without the need to edit or retouch. A front-facing camera is perfect for video calls with colleagues. It doesn’t matter if you leave your charger at home, because Samsung Galaxy Note 9 is built with a huge 4000 mAh battery that’s designed to last longer. Whether you’re out the office all day, or in back-to-back meetings, you can rely on your Galaxy Note 9.